This modern masterpiece reproduction chair is made out of molded ABS plastic and features a painted aluminum cast base. The interior is crafted from imported wool fabric and is spotlighted by dense, rich cushions. The design of the chair was not only striking to look at but it was also comfortable and relaxing to sit in for long periods of time. The chair has been described as ''a room within a room''. It offers shelter, a calming atmosphere and privacy for the seated person. 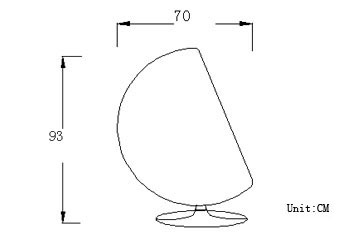 Some models of the chair have had telephones built into them. The chair has featured in films such as 'Tommy', 'Dazed and Confused' and 'Moon Zero Two'. It also featured in such classic television Programmes as 'The Prisoner'.It has even been used by Vivienne Westwood in one of her shows. Your choice of Red Interior with Gloss White Shell or Black Interior with Gloss White shell. 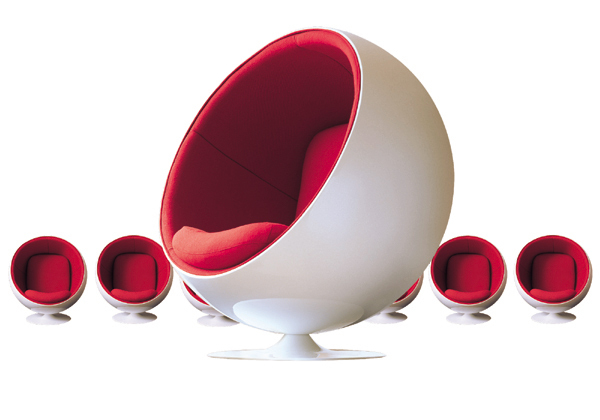 We can also special order the Eero Aarnio Ball Chair with a Gloss Black shell with red or black interior. Special orders for this item have an 8-10 week lead time.